Watch a children’s book come to life in a play that is entirely produced by Ridgefield students! 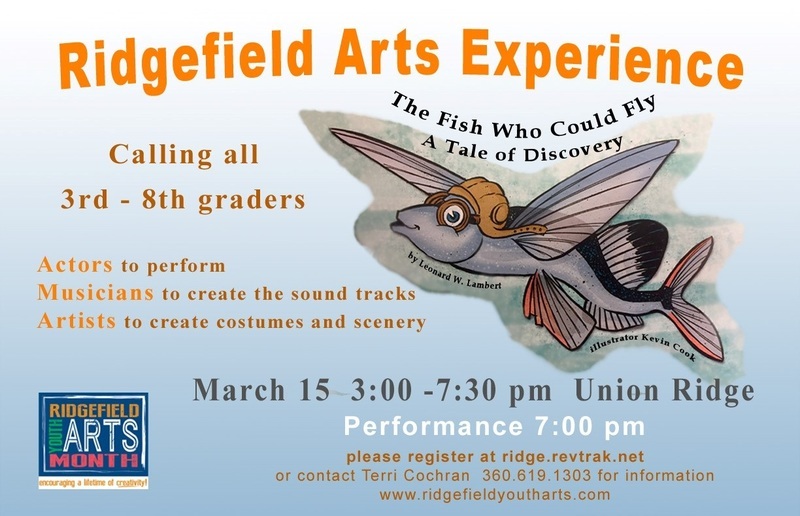 In “Ridgefield Arts Experience”, a Ridgefield Youth Arts class, students in Grades 3-8 learn everything that goes into a musical production. Not only will they be performing in the play, they will also learn to create the scenery, costumes and music soundtracks. The play is based on the children’s book “The Fish Who Could Fly: A Tale of Discovery” by Leonard W. Lambert. Students will perform the play at 7:00 pm towards the end of class. The class is on Thursday, March 15th 3:00-7:30 pm in the Union Ridge Commons. A light dinner will be provided, and copies of the book will be available for purchase. The class is co-sponsored by Ridgefield School District, FVRL Ridgefield Library and Opus School of Music. Register today at ridge.revtrak.net. Meet author Leonard W. Lambert and other authors at Ridgefield Youth Arts Night at Barnes & Noble’s Fourth Plain location in Vancouver, on Friday, March 16th from 5-9 pm. Lambert will give a talk about the book and will be available to sign copies of the book.